OH WHEN THE SAINTS GO MARCHING IN!!!! The ambition this year is to stay in the Premier League and they look set for that, not many teams will go to Chelsea and get a draw. With due respect to Pochettino, what does he know about our game? What does he know about the Premier League? What does he know about the dressing room, does he speak English? Everybody will be feeling sorry for Nigel Adkins. I don’t think he’ll have a problem getting another appointment. At that point, Southampton were 15th in the Premier League, just above the relegation zone. Under Mauricio Pochettino, the Saints went on to finish 14th in the Premier League, going 4-7-5 with 3 of the four wins at home vs City, Liverpool, and Chelsea. This yr, things have been much different for the Saints. Currently occupying 3rd in the EPL table, they have been the feel good story of the Premier League season, resembling Everton’s run last yr when they were 4th at the 11 week mark. They have made the high pressing line their trademark along with English players having foreign names (Adam Lallana, Rickie Lambert). They possess perhaps the best combination of CB’s and DM’s in the Premier League while Lambert is continuing to be an above average Premier League striker at the age of 31. It’s not just their sound defensive play at the back, the CB duo of Jose Fonte and Dejan Lovren are also tremendous in their passing. Per WhoScored, Fonte and Lovren are ranked 23rd and 37th in Avg P per game. That part of their game wasn’t on full display in the Liverpool match, but it was an anomaly in a season where their consistency has defied their pre-season narrative. The two of them have been superb this yr, helping raise the ceiling of Southampton’s season where grabbing a spot in Europe is reasonable. Southampton have scored 15 goals through 11 games, a goals per game mark of 1.36 that’s up from last season’s 1.29 mark. They host a number of attacking options including Jay Rodriguez, Pablo “Johnny Depp” Osvaldo, Rickie Lambert, and Adam Lallana. Lallana in particular has been wonderful to watch, playing in the attacking 3 of a 4-2-3-1 providing the dose of creativity that has helped Southampton grab 14 out of a possible 18 points at home. 2 of his 3 goals have come at St Mary’s Stadium, including his wonderful goal against Hull that was Theirry Henry esque in its individuality/dribbling prowess. Per WhoScored, he’s completed 1.9 Dribbles Per Game, the highest of any Southampton player while also being fouled the most at 2.5 per game. 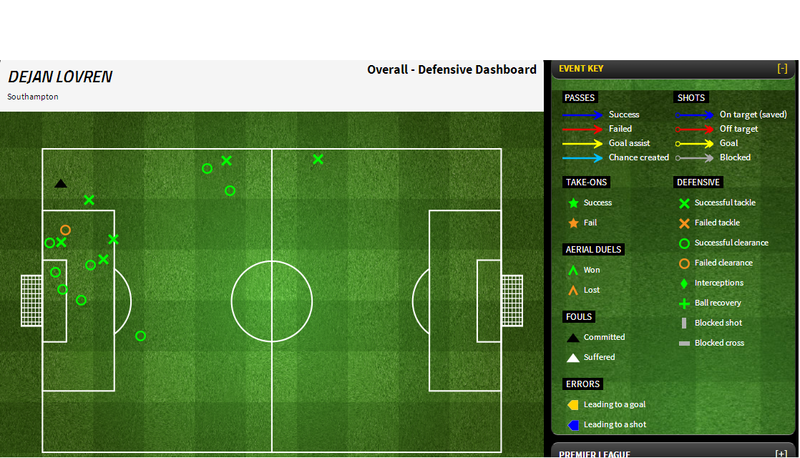 He completed 5 of 7 take ons in the match against Hull, most of any Southampton player in that match. His shooting accuracy is up 15% from 47% last yr to 62% this season. His call up to the England squad for a Friendly vs Chile is the culmination of a great 11 game stretch for Lallana this season, hoping for more to come after the international break. Quantitatively determining how well a team mitigates a high-quality opportunity is a bit more hairy. Looking at the volume and quality of shots that Southampton has conceded, they have conceded 4.6 fewer goals than predicted by the model – currently the largest positive deviation in this year’s Premier League (Conversely, it also provides a glimmer of hope for Sunderland, as their opponents’ conversion rate seems similarly unsustainable). Other factors that contributed to the model used by Devin was the relatively easy schedule for Southampton, including an erratic (at that time) Man U squad and Liverpool sans Suarez, the cannibalistic magician. Southampton currently sport the best Sv% in the Premier League at 83.9%, fueling their 1122 PDO which is also the highest in the Premier League. No matter how talented Artur Boruc is between the sticks, that number will regress, and perhaps matches against the likes of Arsenal (Away), Chelsea (Away), and Man City (Home) in the next four weeks begins the regression train for the Saints. Just how much they regress though is up for questioning. Southampton have come a long way from being relegated to League One in 2009. In four short yrs, they’ve gone from declaring Administration to 3rd in the Premier League. 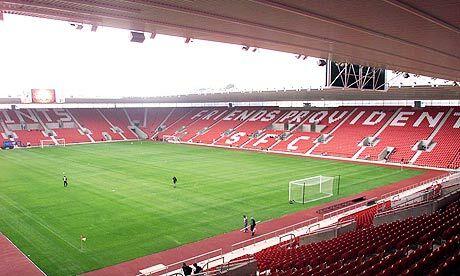 Led by Mauricio Pochettino, the Saints have been flying high (or marching in, whichever one you prefer), playing attractive football and making St Mary’s Stadium a fortress for opposition. Their defense, despite their sparkling form, is due for regression, BUT WHO CARES! THE SAINTS ARE MARCHING BABY! DRUM UP THE BAND AND HIT THE MUSIC! This entry was posted in Uncategorized and tagged Darlings, Premier League, Saints, Southampton. Bookmark the permalink.